Wigs are essential for those of us who want to experiment with different looks but want to protect our hair. With the help of wig masters, many of our favorite celebs are able to go from a short platinum-blond bob to 30 inches of bone-straight brunette tresses in what seems like minutes. For folks who want to wear versatile protective styles without paying astronomical fees for services, however, there’s a wealth of DIY wig tutorial videos on YouTube. Keep scrolling for some of the top wig tutorials to help you slay on a budget. 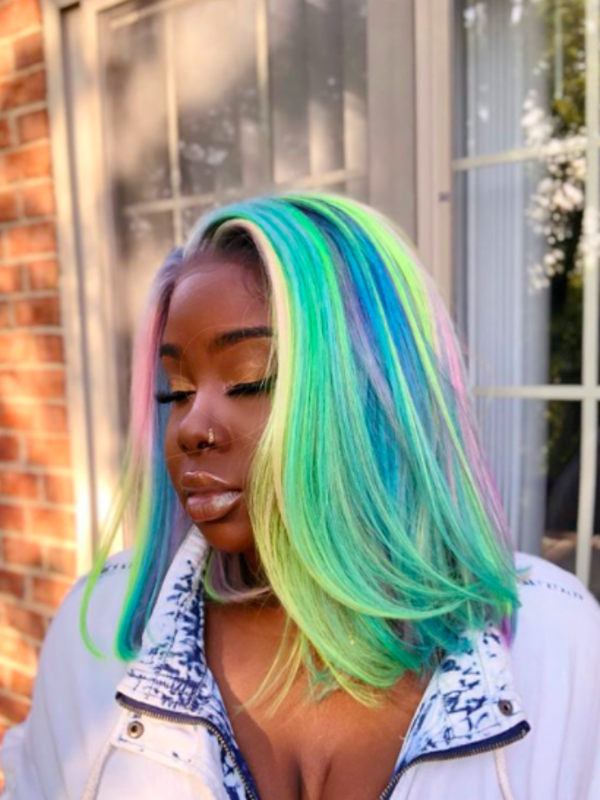 Ivy’s amazing hair tutorials show us how to slay and create unique truly unique looks, like this two-tone ombre hair. In this tutorial she shows us how to get this beautiul and eye-catching rainbow look. We stan! Jodi’s videos offer a variety of styles at budget-friendly price points. This tutorial features an easy application process for beginners who are new to the wig life. Here she shows us how to make a textured crochet wig and how well it holds up after six months. Khadijat’s page covers trends in makeup, fashion and, of course, hair. Her wig tutorials are for those who are a tad more advanced in experimenting with color and cuts. Here she creates a fabulous Beyoncé-inspired wig. This is a very detailed step-by-step on how to prep, color, cut and install a bob/lob lace-front wig. The Chic Natural features natural hair, vegan recipes, makeup, fashion and wigs. This video gives a full-face makeup tutorial and shows us how to apply a blond lace-front wig. Here’s a quick way to create a budget-friendly curly look. Andrea’s channel is great for ladies who aren’t afraid of vibrant hair or makeup color. Here she shares a guide on how to produce a 360 wig, which gives you the option of wearing a ponytail or bun. This tutorial shows us how to create a liquid cap quick weave with a frontal wig. This is a great choice for women with short hair who may want to remove the wig quickly by washing it out. The half-up, half-down wig is pretty popular right now. In this tutorial, Tahari shows us how to achieve a curly textured look with a lace-front wig. Come here for 11 ways to style your half-up, half-down wig. Here you can find out how to reuse an existing wig, blend the lace with your scalp and produce a heat-free, natural look. This tutorial shows us how to do a wet and wavy look on a 360 wig. Tiarra Monet’s page features an entire series on styling lace-front wigs, from construction to customization to installation. Here, Monet takes us through the dyeing process and makes a blond wig ideal for girls with brown skin. Devonna’s tutorial features a five-minute lace-front wig installation for those on the go. One of the keys to a natural-looking wig is how well it’s customized. In this tutorial, Devonna shows us how to pluck, tweeze and tailor her lace closures without using glue or leaving any hair out. A good wig should be versatile. Otherwise, what’s the point? In this tutorial, Shalom shows us how to style a 360 wig in four different ways. Here Shalom customizes a lace-front wig from start to finish. Kiara walks us through the process of sewing a lace-front onto a wig cap. This tutorial teaches us how to tint, bleach and pluck a frontal wig to produce a natural and professional look.